How are humans altering Earth's geology? As a species we have left an indelible mark on our planet through climate change, atomic bombs, and our production of plastics. Written into Rock is a new art exhibition that explores the idea of the Anthropocene, a new geologic era defined by humanity's impact on Earth's systems. It opens at the Ann Arbor Art Center this Friday and I think the exhibition looks fantastic. Written into Rock is the curatorial debut from Gina Iacobelli. Over the weekend Gina was kind enough to answer a few questions for me about the Anthropocene and her process for building this exhibition. Ben Connor Barrie: When we spoke about this exhibition in November, you mentioned it was focusing on the Anthropocene. For our readers who may be unfamiliar with the term, could you explain what the Anthropocene is? BCB: What inspired you to do an exhibition focused on the Anthropocene? GI: I have always been fascinated with the way humans alter the landscape, particularly in terms of industry. I think that is a product of growing up around Detroit. Lately, the deindustrialization and nature’s push-back against these man-made structures, particularly in decommissioned or abandoned sites in the city made me think of the tension between man and nature. It’s a push-pull relationship that is always in flux. This tension is really what the show focuses on – human’s desire to mold and manipulate the landscape and nature’s ability to adapt to these changes. I attended a few lectures last year by Heather Davis, curatorial fellow at Cranbrook. Her work explores the intersection of aesthetics and the Anthropocene. She talks about how we have become anesthetized to human’s transformation of the landscape, and I believe that is true. We take as a given all of the industrial changes that make our life more convenient, from large earth moving projects to mining for minerals that make up the contents of our digital devices. There is a real impact that humans make on the environment and it is important to address that so that we see these changes with fresh eyes every now and again. BCB: How did you decide which artists' work to include in this exhibition? GI: In planning the exhibition I was looking for artists who explore the tension between humans and nature. The topic could have a tendency to be a bit didactic and I wanted to avoid that. Focusing on the more complex interdependency of humans and nature helped guide me when selecting artists. The actual selection process just involves a good amount of leg work. The most important guide for me was to go see as much art as possible. I am based outside of Detroit, so I am very grateful to Megan Winkel, gallery director at the Ann Arbor Art Center for directing me towards some Ypsi-based artists. Studio visits are the best part of putting together any exhibition. That is when you get to really understand the artist’s process and the intellectual foundation of their work. Plus, for me, it is just fun to chat about art and see all the labor that goes into making the finished product. BCB: Are there any artists or works that you are particularly excited about featuring in this exhibition? GI: I am really excited to show the work of Jessica Tenbusch and Kristina Sheufelt. They are both sculptors who incorporate found organic matter into their works – from mouse bones to hornet’s nests. Jessica’s work is very intimate in scale and requires close looking which I particularly enjoy when viewing art. Kristina’s work is made using biological material see scavenges in Detroit and it represents that tension between human and nature so well. She’s mining a landscape that has been significantly transformed by human effort and then later slowly reclaimed by nature. New Orleans-based Hannah Chalew, will be displaying her monumental drawings on paper made of recycled trash. Hannah is asking important questions about waste and is exploring how it commingles with the natural environment. The works are very large scale and will be quite striking in the gallery. Overall the work in the show is quite varied. It incorporates sculpture, painting, printmaking, drawing and photography. 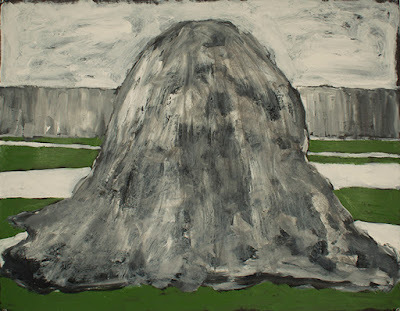 However, all of the artists are working in a vein that deals with landscape or organic forms. I am excited to see the work all come together in the gallery. The dialogues between the different artworks should produce some interesting exchanges about how we interact with the natural world around us. Written into Rock runs April 6th through May 5th at the Ann Arbor Art Center. The opening party is this Friday, April 6th from 6 pm - 9 pm. If you are already planning on heading Downtown for FoolMoon, plan on coming a little early to check out the exhibition. Written into Rock features work by Hannah Chalew (New Orleans, LA), Michael Garguilo (Royal Oak, MI), Phillip Hanson (Saginaw, MI), Kristina Sheufelt (Detroit, MI), Brian Spolans (Ypsilanti, MI), Jessica Tenbusch (Ypsilanti, MI), and Millee Tibbs (Detroit, MI).